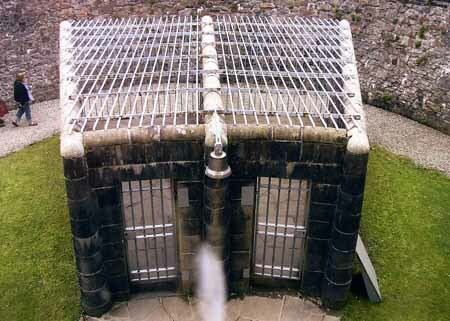 Inveraray Jail was opened in 1820 and is the former county courthouse and prison for Argyll. 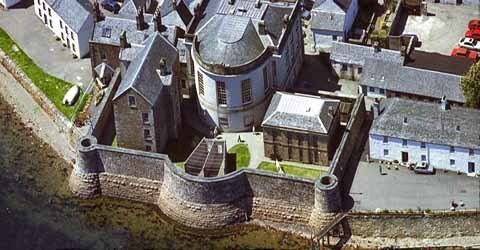 Over 6000 men, women and children were sentenced in the courtroom and served their sentenced at Inveraray. Children as young as seven were detained for minor crimes and subjected to whippings and manual labour. Records also show that the prison held many insane prisoners over the years. The courtroom, on the first floor, has a semi circle of large windows giving a magnificent view overlooking the prison yard and, beyond, across Loch Fyne. The two-storied prison has three foot thick walls of massive rough hewn red stone and originally contained cells on both floors, eight in total. A third of the ground floor was occupied by a day-room which was lit, like the cells, by narrow, unglazed windows. The Prisons Act 1839 (Scotland) brought about many changes, including the separation of prisoners. A second prison was finally built on the spare ground, opening in the closing days of 1848. The new prison consisted of twelve cells on three floors with an exercising gallery at the top. Although last used as a penal establishment more than 100 years ago it appears some of the former inmates have left a lasting impression on the bare gray walls and worn flagstone steps. Now a museum and popular visitor attraction, among the exhibits are the life and death masks of notorious murderers Burke and Hare, a genuine hangman's noose, thumbscrews, birching table, branding irons and iron masks with tongue holders for nagging wives. Inveraray Jail is already recognized as one of the most haunted buildings in Scotland and is a popular destination for paranormal investigators, including the team from TV's Most Haunted. 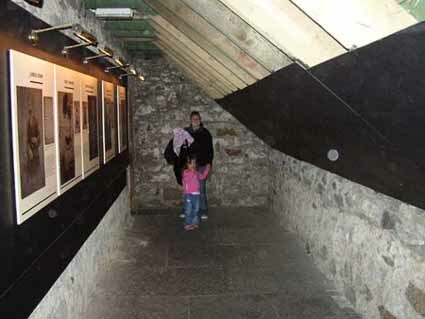 At Inveraray Jail there have been many reported ghost sightings and a long list of unexplained experiences from both staff and visitors over the years. Inveraray Jail has now become a magnet for local and national paranormal groups as the jail is happy to allow organised groups the chance to hold overnight vigils. Staff and visitors have reported ghost sightings and other paranormal activity including cold spots, being touched by invisible hands, and orbs appearing in photographs. Rob Irons, who works at the museum, has plenty of first hand experience of the paranormal activity at the jail. One evening I was going up the stairs in the Old Prison I was trying to pick the right key out to close down the sound system when something black moved clean through me, I dropped my keys and fell to my knees," he said. "I felt a deep chill every hair on my body was standing on end. I called to my colleague at the bottom of the stairs but he said he heard and felt nothing, but I definitely felt it". On three different occasions three women all of different nationalities refused point blank to enter the kitchen area and became very distressed. All three women came to Inveraray at different times and all stopped dead at the entrance to the kitchen and said they couldn't go any further because they saw the ghost of a woman cowering behind the door. The place in the prison that most people react to is cell 10. It doesn't tend to be something people see so much as a feeling they get. Dogs will not enter this cell and many visitors complain of feeling unwell in here. One visitor, Michelle Affleck, 42, was so frightened by her experiences that she has vowed never to return. Michelle, who lives near Crewe town centre, was visiting the jail with her husband and young daughter Gemma, when she became aware of an 'unsettling presence' "when my husband entered the jail we both felt light headed and dizzy and we had a strange sickly feeling. But, we didn't want to alarm Gemma so we couldn't say much at the time." said Michelle. "All the way through I had an ominous feeling there was someone there with us but there was nobody else going round the jail at the time. It was the weirdest sensation. "In one room there was a strong smell of body odour and then in the old jail a door suddenly slammed shut behind us. "However, it wasn't until we downloaded photographs onto our computer that I got really spooked. In two of the photos there were images that definitely weren't there when the pictures were taken," said Michelle. In one picture there were a number of orbs surrounding Gemma and I.
Supernatural goings on at the jail have acted like a lighting rod for professional ghost hunters who regularly conduct seances with mediums, and carry out Electronic Voice Phenomenon (EVP) experiments which have revealed some startling results. Members of staff were talking about a supposed ghost which had been active in the corridor poking people in the back. So for my question I asked are you the one that's been running about in the corridor and have you stabbed anyone in the back." said George Allison, 61, a works manager from Glasgow, who joined in on a late night investigation with a team from Ghost Events Scotland. "When we played the tape back a voice very clearly said 'yes I have,' it was terrifying. "